There is a wide field of applications for Radon measurement from Radon risk assessment to geological surveys. AlphaGUARD products enjoy an international reputation as benchmark devices for the calibration of active and passive radon detectors. Bertin Instruments is launching a new generation of its AlphaGuard radon measurement solution. 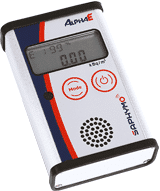 Developed with Saphymo’s expertise, the new AlphaGUARD is designed for instantaneous or continuous measurement of radon gas activity in air, water, soil or material.